Systems analysis could be an essential approach to shape resource efficiency policy in a sustainable long term perspective. In the SimRess project, we tested systems thinking to develop a system dynamic resource use simulation model and ii) to investigate policy mixes for resource conservation. The report, which is available for download, documents and summarizes the various results of the workshops and the systems analysis. The study was carried out by the SimRess project partners, with Martin Hirschnitz-Garbers from Ecologic Institute as lead-author. Diverse and complex interactions as well as multi-actor systems characterise resource use and resource policy. This makes system analysis a relevant tool to orient resource policy towards the long term. Analysing such complex systems requires systemic thinking, consideration of causal loops as well as time-lags and delays in system responses. In the SimRess project, system analysis encompassed participatory conceptual system modelling via involving external stakholders into identifying system boundaries and elements via causal loop diagrams (CLDs). The CLDs were than reflected in the parametrisation of simulation models and the development of policy mixes. Only a limited number of stakeholders participated in two of the five workshops needed for a fully-fledged group modelling process. Therefore, the project team finalised internally the conceptual system model. Although this reduced ownership and transparency of the system model, the two workshops provided relevant system knowledge for further modelling work and policy mix development. During policy mix development in SimRess, we needed to deviate from the theoretical concept of policy mixing based on available project capacities and stakeholder decisions. On the one hand, understanding and assessing cumulative effects of policy mixes challenged conceptual policy mix development and simulation capacities. On the other hand, stakeholder decisions impacted on the depth at which system analysis via simulation models could be undertaken. Hirschnitz-Garbers, Martin et. al. 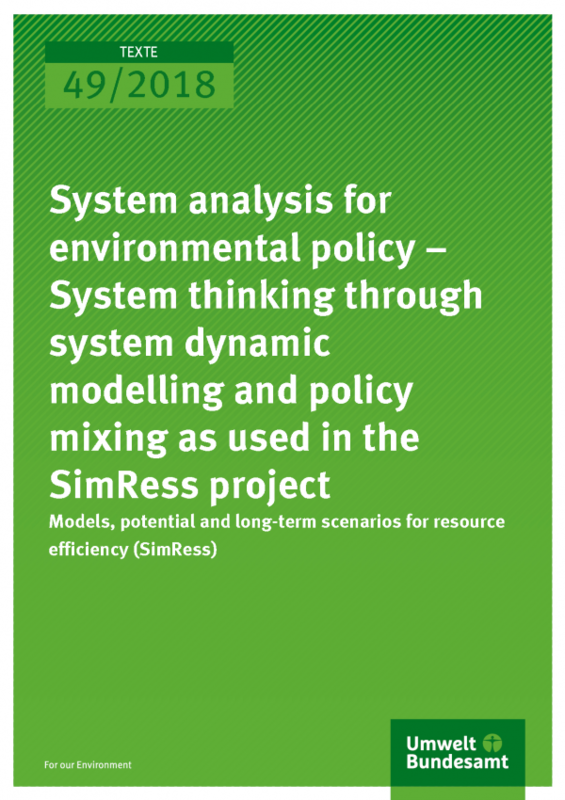 2018: System analysis for environmental policy – System thinking through system dynamic modelling and policy mixing as used in the SimRess project. Models, potential and long-term scenarios for resource efficiency (SimRess) – Report 1. UBA Texte 49/2018. Umweltbundesamt: Dessau-Roßlau. 1.4 How do two modelling approaches complement each other in terms of system analysis? Figure 5: With mining industry, various metal ores are provided to different metal industries to be processed into basic metals. Different fabricated metal industries then turn these basic metals into fabricated metals.